John Deere Company is in the business of John Deere riding lawn mowers since 1963. 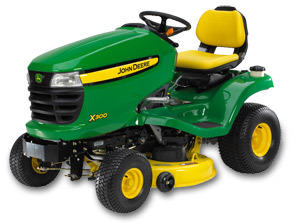 John Deere Riding Lawn Mowers are the most popular lawn mower machines liked by the people all across the globe due to the superior quality material and advanced technology used in them. The company has a variety of riding lawn mowers which perfectly fits the requirements of all types of the consumers. Most of us do not like handling heavy machinery while cutting the grass and often thus gets tired by doing all the hard work involved in the process of manual mowing. This is the main reason why customers prefer buying riding lawn mowers than the simple push lawn mowers which results in consuming extra efforts and time alike. John Deere Riding Mowers have an opening of a rear mechanism bag or dump box from where the cut grass is being expelled out. A few of them also have a grass catcher which is clipped at the front of the mower. They also have got the edge cutting system that provides accurate cutting. The products under the label of John Deere Riding Lawn Mowers cover the wide range of CR and LR series, X100, X300, X500 and X700 series. The CR and LR series consists of CR125 5-speed, CR125 Automatic and LR135 which have a capacity of giving 28 inch to 36 inch cuts, mowing an area of up to 4000 m2 and have one of the best known engines for mowers called Briggs and Stratton. They are comfortable, powerful and a lot of fun to use. The X100 series includes the X124, X145, X155R and X165 with a mowing area of up to 6000 m2 and cutting of up to 48 inch providing durability and long term investment benefits. The X300 series inventory claims X300, X304, X300R and X320 which covers an area up to 8000 m2 and cutting of up to 48 inch with benefits of accurate and great cuts with small blades. The X500 consists of X534 and X540 with a mowing area of over 8000 m2, cutting up to 52 inches, engines of John Deere iTorque and benefits mowing for all terrain. The X700 has X740, X748 4WD and X749 4WD 4WS with a mowing area of over 8000 m2, cutting up to 62 inches, engines of Yanmar and benefits like all in one. John Deere Riding Mowers would cost you £1750 to £2200 excluding and including of VAT. The edge cutting system of the John Deere Riding Mowers provides its users the great versatility, superior cutting technology and high security deck housing. It has several advantages like cutting every kind of sized grass, options to carry rear or side discharge bags. It has been introduced with very small and sharp blades that give an accurate cutting and are strong enough to withstand all types of the terrains even if accidently hits pebbles etc. It has the two kinds of deck housing facilities i.e. the turbo-star mower deck and the mulching mower deck leaving the option on the user to choose whatever kind of deck he might prefer. It is generally seen that many people receive severe injuries while using substandard lawn mowers, due to their blades or fire hazards. One of the reasons why one must prefer using John Deere Riding Lawn Mowers is that it is 100% safe to use unlike others in the market. Though people are advised to exercise vigilance and take prior safety precautions to avoid getting hurt while using any types of the mower. Even it is recommended that the user must wear boots while using lawn mowers as it protects you against the grass sharp ends that might result leaving you with a cut skin. The petrol lawn mowers emit pollution which is an environmental hazard as it pollutes the environment 4 times more than the car pollution besides being a source of increasing noise pollution as well. But with John Deere riding lawn mower around you need not to worry about any of these issues as this mower helps reduce the pollution by 35% more as compared to the other lawn mowers available in the market these days. John Deere Riding Lawn Mowers are durable and offers a variety of product range that fits the lawn mowing requirements of all types of the users.